It’s finally spring time in Iowa! 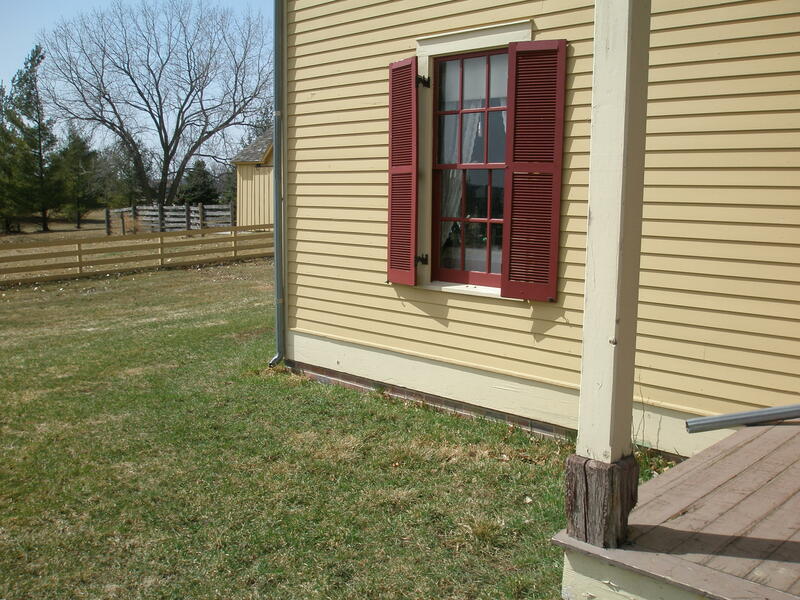 The grass at Living History Farms is starting to turn green. Our museum guides are getting all the historic houses and shops ready for you to visit soon! That means it is time for spring cleaning. 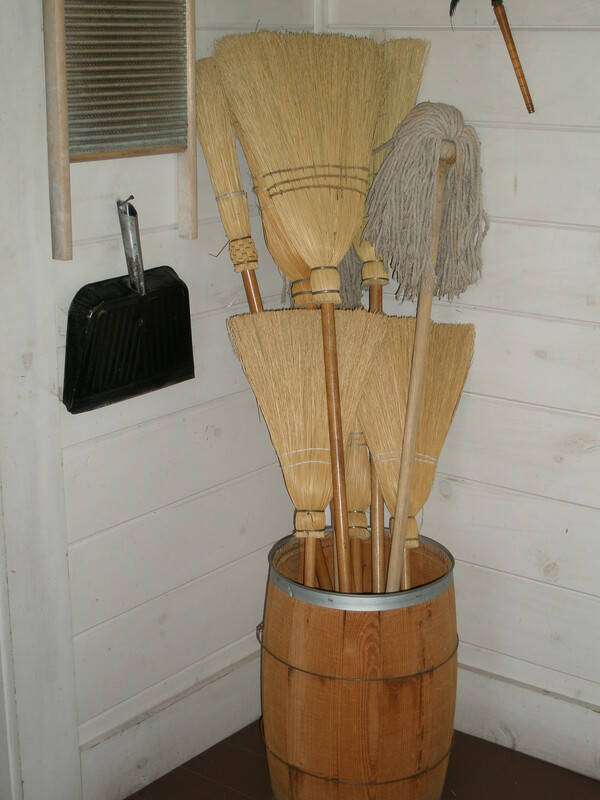 Even people over 100 years ago liked to clean out their homes in spring! In 1877 (that’s 137 years ago! ); a how-to-do-it book was written in Minnesota called Buckeye Cookery and Practical Housekeeping. Do you do any spring cleaning at your house? Think about what it might have been like to clean a house a long time ago! When your family cleans their house now, I bet you use one of these. 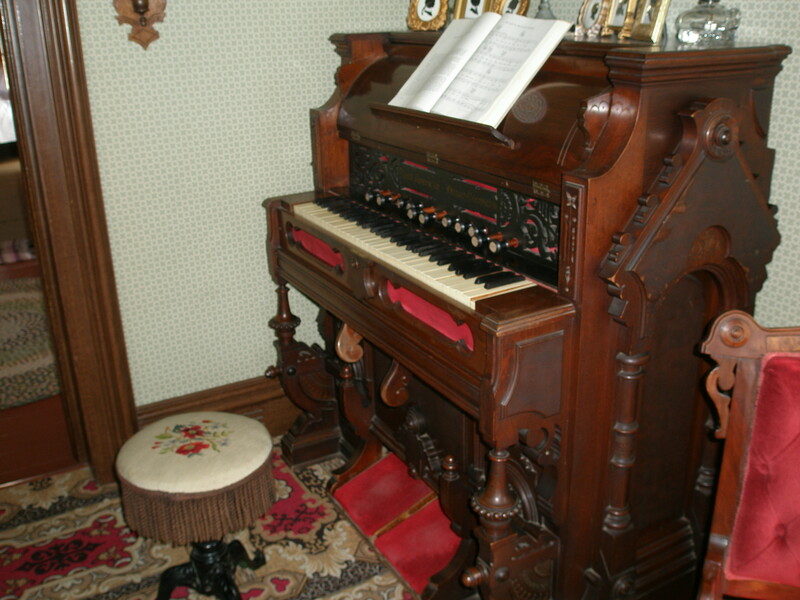 When an Iowa family cleaned their house in 1875, they had to do everything by hand! They did not have electricity to help them! 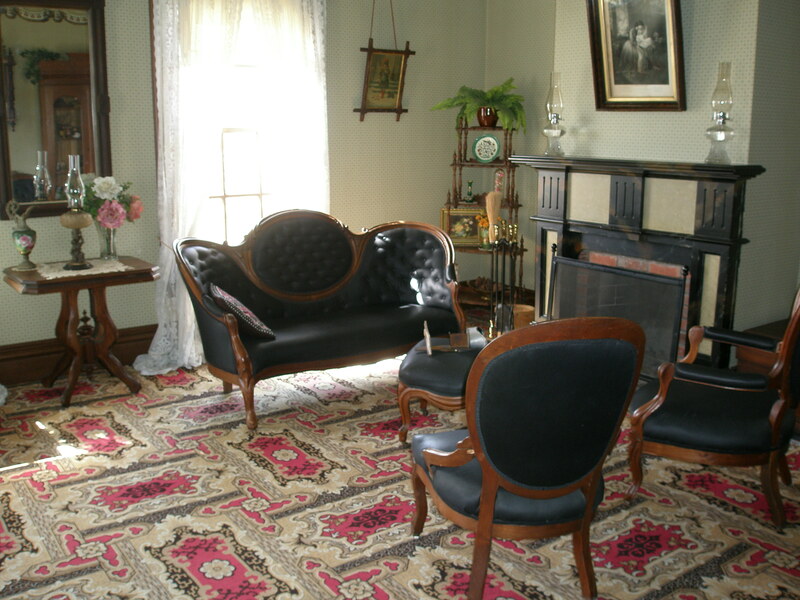 Let’s visit the Tangen House in our town of Walnut Hill and see how it was done. 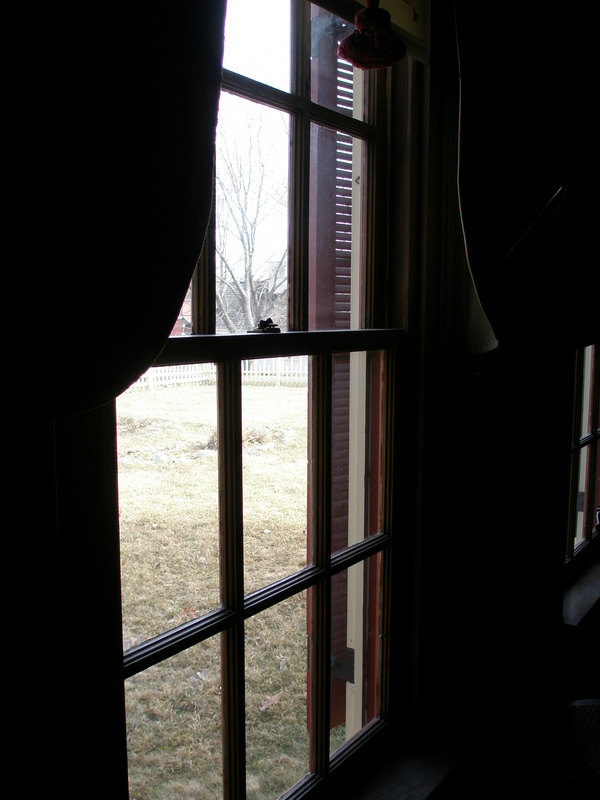 Buckeye Cookery says to start cleaning in the parlor—that’s a fancy room used just for company. It has a lot of furniture, like sofas and chairs and wall to wall carpet! How did they clean a carpet without a vacuum? The carpet is sewn together in strips. It could be taken apart and carried outside. The carpet strips and any rag rugs would be hung over the clothes line and beaten with a wire rug beater. 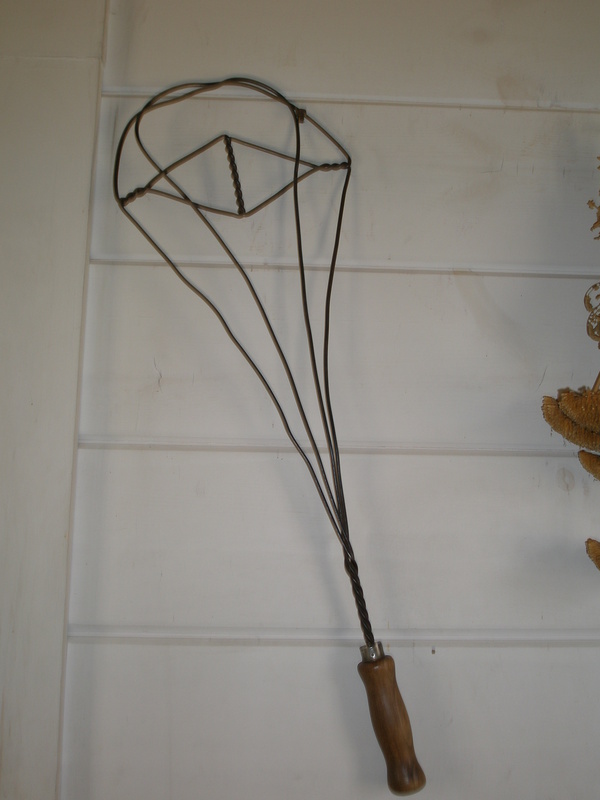 In the spring, a house keeper could also use a rug beater to beat the dust out of the stuffed chairs and sofas. A feather duster, made of chicken feathers, or a soft cloth was used to wipe away dust on shelves and the statues, vases and pretty things on them. And there are an awful lot of fussy things on shelves that have to be dusted in this house. Wow! “Clean the corners and edges with a sharp-pointed stick and stiff whisk broom”. Hmm. . . I think someone missed this corner. I better go find a stiff broom. 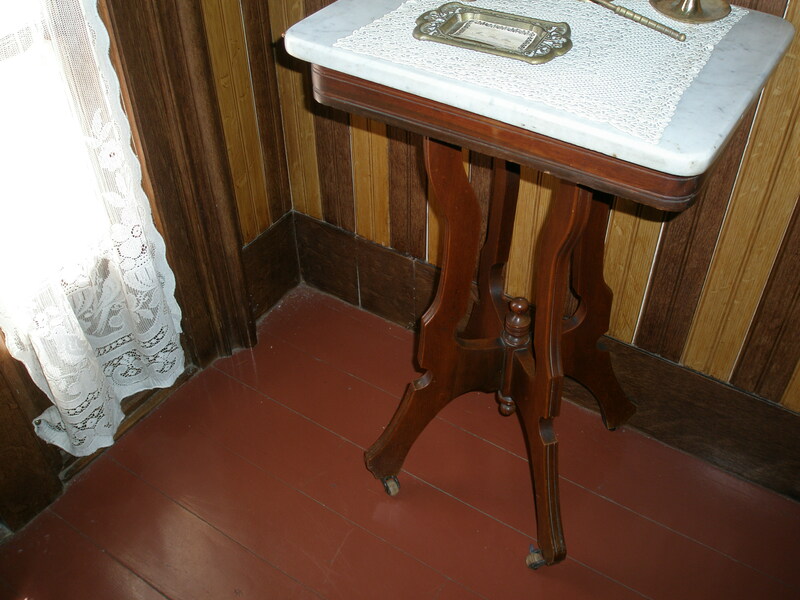 A damp rag could be used to wipe the wood furniture and wood trim. On some fancy tables and chairs and especially the organ, the carving was hard to dust and the book says to dust the fine carving with a paint brush! Would you want to come over and brush all those carvings and curls? Windows had to be washed with rags or newspaper. The Tangen House has an awful lot of windows. Would you want to clean them all, inside and out? Instead of a spray bottle of chemicals, most housekeepers used a pail of vinegar and water to wash their windows. 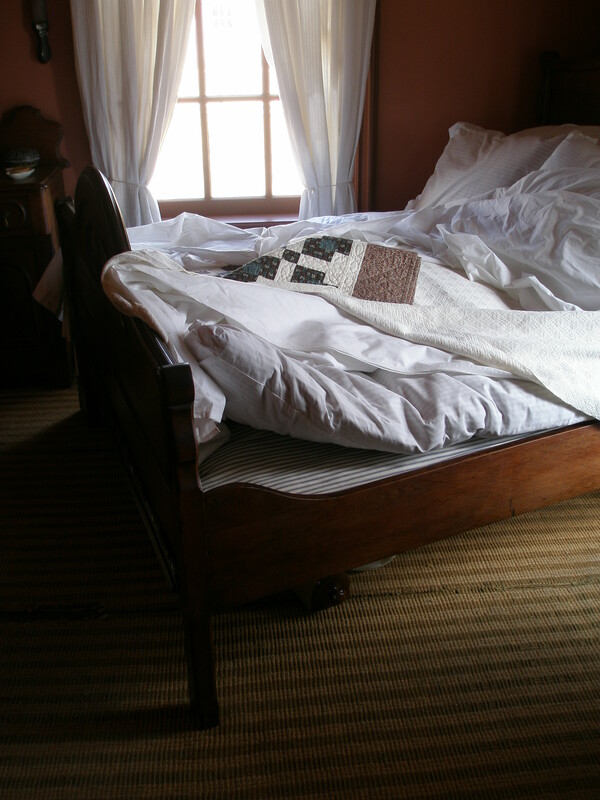 In the bed room, the Buckeye book said to take apart the wooden bed frame and wipe it down. The family might even use a salt water brine to wash the bed. It was supposed to kill bed bugs! The bed mattresses were stuffed with straw or corn husks. Our Buckeye book says to re-stuff them in the spring and lay them out in the sunshine to air out. In the kitchen, all the counters had to be washed and rubbed clean by hand. Children could help sweep and mop the floor and carry water for all this cleaning! “On Monday, wash; Tuesday, iron; Wednesday, bake and scrub kitchen and pantry; Thursday, clean the silverware, examine the pots and kettles and look after store-room and cellar; Friday, devote to general sweeping and dusting; Saturday, bake and scrub kitchen and pantry floors, and prepare for Sunday. Have the sitting-room tidied up every night” before going to bed. Kids helped with many of these cleaning chores in 1875. Even very small children could help pick up the sitting room. What about now? Do you have to keep your own room clean? Is it your job to take out the trash or pick up your toys? When your family does their spring cleaning or sorting out, can kids help with those chores? 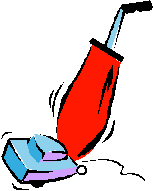 Share what kinds of cleaning chores you have to do at your house! Tell us which ones you like to help with and which ones you hate to do! Would any of those chores be more fun in 1875 or a lot less fun? Do you agree? I don’t know. When I clean my house in 2014, I like to be loud while I do it! Nice article ! Thanks for sharing!